Vtiger Custom Modules. How to import a new module. Adding a Vtiger custom module to your CRM, is a great way to extend your CRM functionality, improve your team effectiveness and enhance your software. 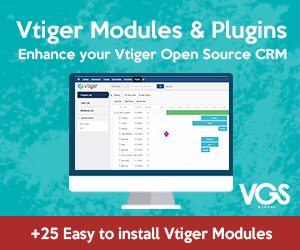 Vtiger CRM provides a Module Manager section which can be used to enable, disable and configure the existing modules in the CRM. It also provides the ability to add new modules from module manager zip files. We will explain how to do this in the following tutorial. Step 1: Click the Settings icon located at the top right-hand corner and select “CRM Settings” in the menu. This will take you to the Settings page. Step 2: Here you will get to see the Studio Tab on the extreme left column of the page. Click on studio and you will see the option “Module Manager”. Step 4: This will open a new page where you will be asked to choose the file that you need to import. Just click the choose file icon and select your module zip file – we ae using the “VGSRelated Field Generator” module for the import in this tutorial. After you have selected the file, make sure that the checkbox “I accept with disclaimer and would like to proceed” is checked and click on the Import button. Step 5: On the next page, click the checkbox “I accept the license agreement.” and then press the “Import Now” button. Step 6: That’s it, the module should be installed now, and you should get a message confirming the same. Step 7: Press the “OK” button which will take you back to the “Module Manager” page, where you can see the new imported module. After the module is successfully installed, you would be able to activate/deactivate the module or configure the settings from under module manager. So, get a Vtiger custom modules, play around and let us know how your experience went.